Wool-Aid is a community of knitters and crocheters who create warm woolen garments for children who live in the coldest climates and have the least access to resources. We work with organizations that put the human imperative first; that provide aid regardless of the race, creed, or nationality of the recipients; and that do not use aid to further a particular political or religious viewpoint. Priority is given to helping populations where washable items are neither required nor recommended. 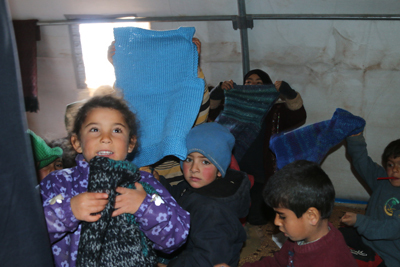 Our mission is to provide the very neediest children with wool socks, sweaters, vests, mittens, hats, and blankets. Please see our Wool-Aid Guidelines. Our Wool-Aid brochure is available in PDF format for easy reference, and for sharing with relatives, friends, knitting groups, and your LYS.